Once an animal is removed, the mess that is left behind can be unhealthy as well as unsightly. Nuisance Wildlife Removal in conjunction with Advanced Attic Restoration can clean up the mess and make the repairs necessary to ensure a healthy environment for your family. This is a service that Nuisance Wildlife Removal offers to rid your home of animals that have gotten into your attic, or under your home. We do offer an eviction process either by means of trapping or natural scents that make the animal feel as if they are in danger and leave on their own. In the unfortunate event that you have an animal die, either in your attic, down a wall, or under your home, the smell can be unbearable. Nuisance Wildlife Removal will come out and locate & remove the dead animal and use odor controlling enzymes in the surrounding areas to eliminate the odor completely. Nuisance Wildlife Removal offers many methods of Bird Control for both residential and commercial properties. All methods are used to deter & prevent the birds from roosting and causing a mess. All methods used are humane & safe. Nuisance Wildlife Removal offers only humane removal and relocation of wildlife. We use live catch traps to capture the animals and then we relocate them to a better more suitable environment. Rodents can be a problem in even the most upscale housing. They can cause damage to your home as well as carrying disease. Let Nuisance Wildlife Removal find the most feasible way to rid your property of any size rodent. Got a bat in your house? Be safe and call Nuisance Wildlife Removal to quickly capture and relocate the bat to another area. Bats can carry disease and possibly rabies, so call a professional rather than try to remove a bat yourself. Moles, as you may know, can destroy a lawn in no time. There are several steps to ridding yourself of moles. Nuisance Wildlife Removal offers a trapping programming that generally takes 30 days to complete. We have to identify the main "highways" of the mole, set traps and then check them several times a week moving them if necessary. Once we have captured the moles you then need to have your lawn treated for insects to deplete the food supply so the problem does not reoccur. your local pest control company can assist you in that matter. We all know that Bees & Wasp can be dangerous, that's why we here at Nuisance Wildlife Removal are AHB certified. We are certified to handle Africanized Honey Bees, which have become a concern over the past year. We use low to no toxic chemicals to exterminate them, offer a cleanout process and then seal up for prevention. If an animal has died in an interior wall, duct or anywhere else in your home, Nuisance Wildlife Removal can remove the animal and will take the steps needed to restore a healthy environment for your family. Nuisance Wildlife Removal will relocate any hog found on your property to an appropriate environment. This includes trapping and transport of the animal. 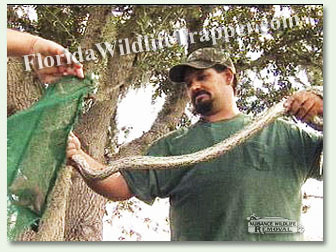 Nuisance Wildlife Removal can remove snakes and relocate them to another property. While there are few deadly snakes in Florida, snakes can be a nuisance to your family and pets.